Hello friends! 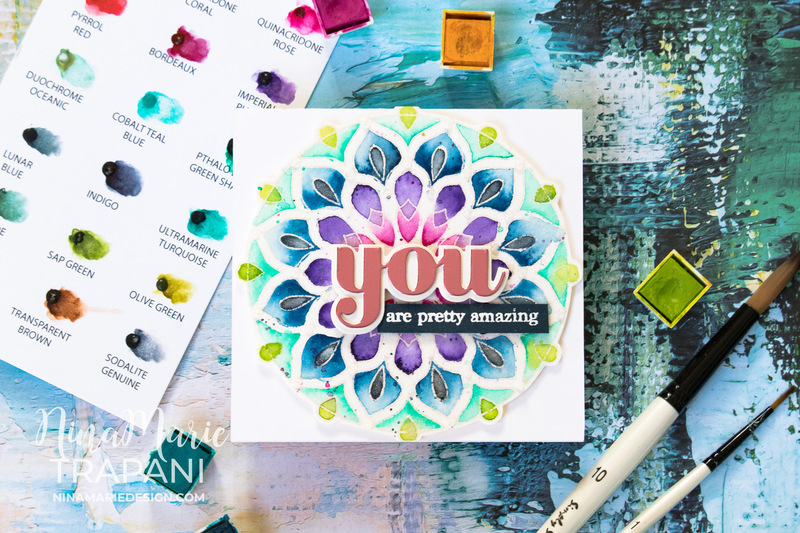 I am back today, sharing a project that features the new Birch Press Designs Shining Mandala stamp set. Because the mandala design is an outline and perfect for coloring! For my card today, I used some of my favorite Daniel Smith watercolors. I embossed the outlines with one of my favorite embossing powders, Singing in the Rain by WOW. 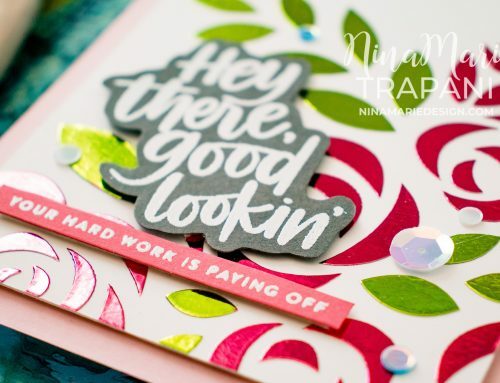 This glittery, clear embossing powder catches the light and gives a rainbow effect; it is so pretty! With my Daniel Smith watercolors, I colored each section with a different hue. Instead of using water and a paintbrush however for the coloring, I decided to give the watercolors a shimmery effect and used an Aqua Flow shimmer water brush from Tonic Studios. The result is a stunning, glittery finish! After coloring, I used my Tonic Studios White Blizzard Nuvo Drops to add glittery dots in between some of the shapes of the mandala. This card is literally shining with subtle glitter! The sentiments on the card are from Birch Press Designs’ Big You Sugar Script die set and Simon Says Stamp’s You Matter stamp set. I cut the word “you” from Tonic Studios Pink Chiffon Mirror Card; I stamped the other greeting onto navy cardstock with white embossing powder. I had so much fun putting this card together, and I hope you have been inspired by it! My friend, Kathy Racoosin is hosting her latest 30 Day Coloring Challenge this month, and this is the perfect stamp set to use for some relaxing color-time! If you enjoy coloring, you should check out Kathy’s challenge and join in the fun! Thanks so much for visiting me today! Happy Sunday! Steals and Deals from Simon Says Stamp! Don’t miss these awesome Steals and Deals from Simon Says Stamp! These prices are applicable for a limited time only or while supplies last! Such a beautiful Mandala Nina, great colours. Such a pretty design!! Love the colors! !